Allows external interference in Sri Lanka’s domestic governance evidenced by TNA’s frequent visits to India, using Tamil Nadu as the ‘Trojan Horse’ to follow their racist and divisive Eealm agenda. Consider establishing village and district based, development centric institutional structure with elected representatives to empower decision making at grass-root level. 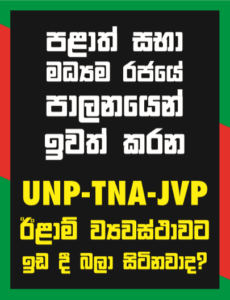 Get rid of the number of politicians populating a bloated four-tier governance arrangement in Sri Lanka, draining the public purse. With the repealing of the 13th Amendment, Sri Lanka will prosper as a Unitary State where people will live as one enjoying the full gamut of human rights equitably. At present, the toxic 13th amendment provides a safe heaven and a camouflage for separatists, racists and international agents to freely prosecute their agenda to Balkanise Sri Lanka. Its time to once and for all to extricate ourselves from the political handcuffs put on us by the Indians nearly 25 years ago.